Dr. Angelova is the dentist owner of our office. She is also holding a part-time teaching position as a Clinical Assistant Professor of General Dentistry at the University of Texas School of Dentistry in Houston. Dr. Angelova graduated from Loma Linda University School of Dentistry, a prestigious dental school in California, at the top of her class with an Advanced Standing in Clinical Training Certificate. She has over 20 years of experience as a dentist and is very well trained in all aspects of general, cosmetic and esthetic dentistry. She is well known and respected among her peers and students. Dr. Angelova is constantly updating her knowledge through additional training and continuing dental education and is considered to be a true expert in her field. 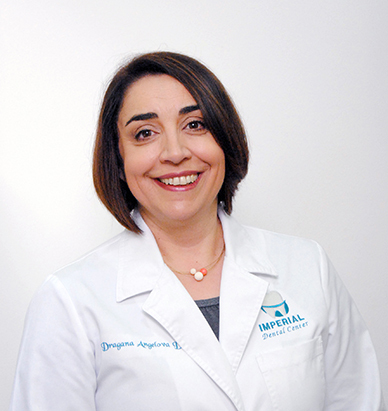 Dr. Angelova ran a very successful dental practice in California, before moving to Texas. Dr. Angelova has published numerous scientific articles in relevant dentistry journals and has presented at relevant dental scientific meetings, such as American Association of Dental Research. In addition, Dr. Angelova is an active member of all relevant dental professional organizations, such as the American Dental Association, Texas Dental Association, and Greater Houston Dental Society, among others. Dr. Angelova is married and has two children. She resides in Missouri City, in Sienna Plantation. In her spare time, she likes to spend time with family and friends.